Ever felt a yearning to uncover the mysteries of the past on an archeological dig? Well, now you can, without leaving your desk. A new citizen science project is looking for volunteers to hunt through ancient rocks for signs of fossils. At FossilFinder.org, you'll be shown a series of aerial photos from Kenya's Lake Turkana basin. 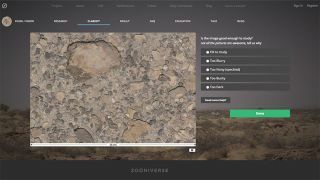 Your goal is to spot fossils, stone tools, and classify rocks in the images, which were taken by drones and camera hung from kites. No experience is necessary - plenty of tips are given when you visit the site. Lake Turkana basin is home to discoveries of some of the most important discoveries in human evolution - including many of the earliest stone tools and fossils of primitive hominids. The data gathered on Fossil Finder will be used during an expedition in February to pinpoint objects of interest. "The aim is to surpass what could be ordinarily achieved with a more traditional boots-on-the-ground model of exploration," says Adrian Evans of Bradford University, who is coordinating the project. He says that 900,000 images have been collected of the site, with 46,000 of those already online. So far, eager fossil finders have analysed 32,000 of those images. Finds have included an extinct crocodile specimen, hippopotamus teeth and various stone tools.